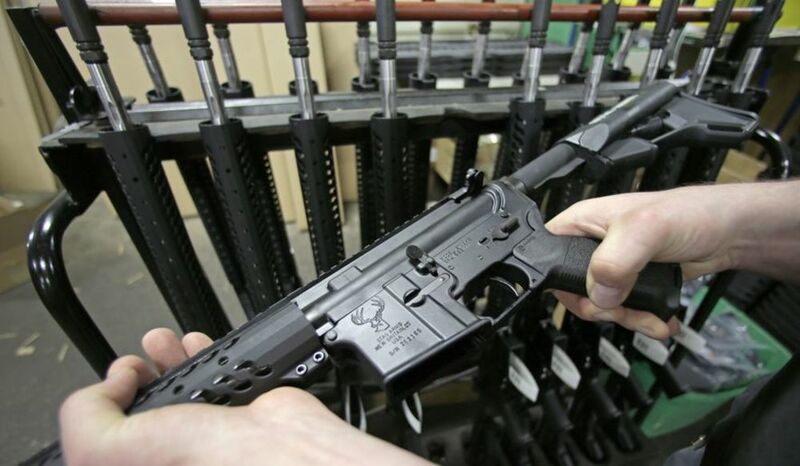 North Dakota has decided to recognize the Second Amendment inside of public schools in a way that's certain to infuriate the radical liberal left, by asking for funding for fifteen AR15s for school resource officers in Bismarck, North Dakota. The 2019 budget proposal for the Bismarck Police Department includes a whopping $26,000 in taxpayer funding for body armor, bleed control kits, and the AR15s, in which Bismarck Police Chief Dave Draovitch says the Department plans to use in middle schools within the state. Each of the high powered firearms will be kept inside of a gun safe on school premises, to which will keep students from obtaining access to the firearms, but ensuring that it necessary for a resource officer to a access the weapons they would have them close to reaching at all times. "The SROs (school resource officers) will be the only ones who have access to this equipment," Chief Draovitch said. "Hopefully we never find ourselves in a situation of an active shooter. But if we do, we really want to make sure that our SRO's are equipped with the tools that they need to do their job effectively," Bismarck Public Schools safety coordinator Becky LaBella said to <a href="http://www.kfyrtv.com/content/news/Emergency-kits-discussed-for-some-Bismarck-schools-490596781.html">local news affiliate KFYR TV </a>in an interview. Inside of each of the safes would be an emergency kit in case of an active shooter on school grounds, which would ensure that resource officers could defend themselves accurately and appropriately against the threat. These types of emergency kits could make their first appearance at middle schools and high schools in Bismarck next year if approved by the City Council, and taxpayers agree to fund additional protections for students in public schools. Both the Bismarck Police Department and the Bismarck school district are taking a much needed proactive approach to protect classrooms after the Parkland shooting earlier this year left countless students dead in Florida, and there has since been an ever raging gun control debate among parents and politicians across the nation. Inside of each school in Bismarck there would be one safe, which would secure at least one rifle, a ballistic carrier, which is basically a police vest that can protect officers from a rifle gunshot, and a unique bleeding control kit that could stop severe gunshot wounds from taking the lives of students before emergency medical responders have a chance to arrive at the scene. Most experts believe that when these types of high powered weapons are used in school shootings, that schools should have a strategy in place to ensure that each of the students are able to survive an extended presence from an active shooter, as well as giving law enforcement on the scene a fighting chance to defend against high powered weapons if necessary. As we saw in Parkland, many officers were trapped outside the building with a handgun they in no way stood to defend against the high powered weapons of the shooter, which seemingly makes little sense. Meetings between leaders on both sides of this initiative have offered differing opinions on the idea of having strong and high powered weapons inside the school, but both sides agree that if the safe is secure and only school officers will have access to it, it could save lives. The bleeding control kit would have multiple tourniquets, gauzes and things officers could easily get to if someone had a gunshot wound, and specific members of the teaching staff would be trained to utilize those types of first aid responses in order to save lives on the school grounds. "We've trained our patrol officers and our SRO's that they have to deal with a school shooting immediately. There's no waiting for a special team or anything like that," Bismarck Police Lt. Jason Stugelmeyer. Stugelmeyer says adding these kits to schools will help their response time. He says the safes will be quick to access for the school resource officers. "The safe's gonna obviously be a hardened safe that is not going to be easily accessible. But, there are going to be behind a second locked door or security area," said Stugelmeyer. Some parents have worried that this would result in an officer opening fire on a shooter versus trying to subdue the gunman, but others agree if it is necessary to take the life of a shooter to protect the students overall this is something they're willing to see happen. If a gunman were to open fire carrying a semiautomatic rifle or machine gun, and the one to two resource officers on campus have a handgun, the likelihood of stopping them is slim to none without the officer taking a serious injury. Safety is important at every level of the school, in both having metal detectors in place, locking mechanisms on classroom doors, and also ensuring that the firepower is available to stop a gunman with nearly unlimited ammunition. Republican Governor of Texas Greg Abbott released a brand new <a href="https://thegoldwater.com/news/27579-Texas-Gov-Abbott-40-Point-School-Safety-Plan-Arm-Teachers-and-Hire-Veterans-for-Security"> “40-Point School Safety Plan” </a>on Wednesday, which has introduced fresh ideas for protecting students in public schools including arming teachers and hiring Veterans for securing the premises of the educational facilities. “When an active shooter situation arises, the difference between life and death can be a matter of seconds,” Abbott said. “Trained security personnel can make all the difference. The new plan from Abbot comes after the deadly shooting in the Sante Fe Independent School District, where survivors of the atrocity including one high school senior from Sante Fe ISD spoke that she would feel safer if teachers were armed. “Arming teachers, and not knowing who is armed, that is what we need,” said a Santa Fe senior who participated in the Governor’s roundtable discussion. Her sentiment was shared by many students and parents who attended the event, according to Abbott. “School marshals serve as one of several options school districts may use to arm security personnel on campus. Some educators stated that the program is not right for their school,” Governor Abbott’s plan states. One of the recommendations in the plan is to increase the number of school marshals by funding their training this coming summer. The marshals will be teachers and staff members who voluntarily take the proper firearms training courses, and as per the Governor's plan the Texas Education Agency must issue a letter to all school administrators no later than June 8th, 2018, encouraging them to identify all willing school personnel in order for them participate in the marshal program. This will be funded from the Governor’s Criminal Justice Division, and all costs of training from June-August of 2018 will be paid to help reduce the threat of active shooters in the upcoming 2018-2019 school year. As per the 2013 Protection of Texas Children Act, school districts were granted the authority to commission school marshals, and this will be used to protect students. Current law only allows for one school marshal for every 200 students, equal to about one marshal for every 8-10 classrooms. Schools should be allowed to recruit up to one marshal for every 100 students, or about one marshal for every 4-5 classrooms, to provide for more comprehensive campus protection with the Governor's recommendations, which will require lawmakers to come into Austin and legislate immediately. Governor Abbott is also asking to remove the current firearms storage requirement for school marshals who are in direct contact with students, allowing them to carry a firearm safely on their bodies at all times. This new policy will guarantee that in a worst-case scenario of an active shooter is on campus those marshals will be designated to protect their students and eliminate a threat before the potential injury or death toll can rise. “If there is consensus on some laws that could be passed, I am open to calling [a special session]," Abbott said. What's most important to parents is knowing that their children are safe, and without a strategy that allows resource officers to fight back against high powered weapons, there simply is no guarantee for parents. The funding for these safes has yet to be approved, but it's believed, with high likelihood, that such a measure would pass. We have the Second Amendment in America, and it's our right to carry outside of schools however we please of we follow both state and local laws, so why wouldn't the police be given the same respect and capability to protect us from those driven over the edge? Right now, some officers do have these tops of weapons inside their vehicles, but it such a need arises to have to use this firearm inside the building, heading to the parking lot could be the difference between life and death. How do you, the people feel about this type of weapon having easy access got resource officers inside schools? Do you feel more safe knowing officers would be able to access this type of firearm? Let us know in the comments. Exactly what I've been saying for years!